I have been eyeing this ruffle neck stripe top for quite some time now, so I was very excited to find that it was reduced this week at Nordstrom! One of the things I love most about this top is, obviously, the ruffle detail of the neckline. It adds a little something extra to the already amazing striped print. I also have been thinking quite a bit lately about transitional season pieces and I'll have to say that this is the perfect top for transitioning into fall. This top is colorful like summer yet still appropriate for fall. I can easily see putting a sweater over it once the weather turns a bit more chilly. Today was actually one of the coolest days that I can remember in a while but it was still in the 80s! I actually tried this top on with several different pants before deciding that it could definitely be worn with jeans year round. In the future, I might try the top with some skinny velvet pants in jewel tones but, again, I think that look will be more appropriate once the weather cools down a bit. For summer, pairing it with white pants would be perfect. All in all, this is a top that I can easily see wearing in a variety of different ways for all four seasons. So, for something that was under $40, I think I'll definitely be getting my money's worth out of it! I love that this top and those shoes go perfectly together! I don't know but I feel like I don't see you in jeans so much? I love how you styled them! 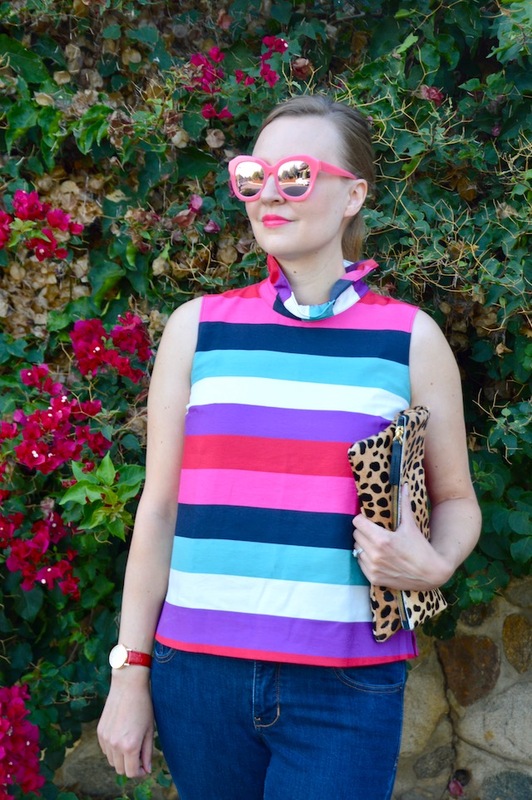 Beautiful colored stripes in this top for a very cool look! Love both the top and the shoes! Smaller pieces like this could be a great way for me to baby-step into brighter tones and mixed color palettes. 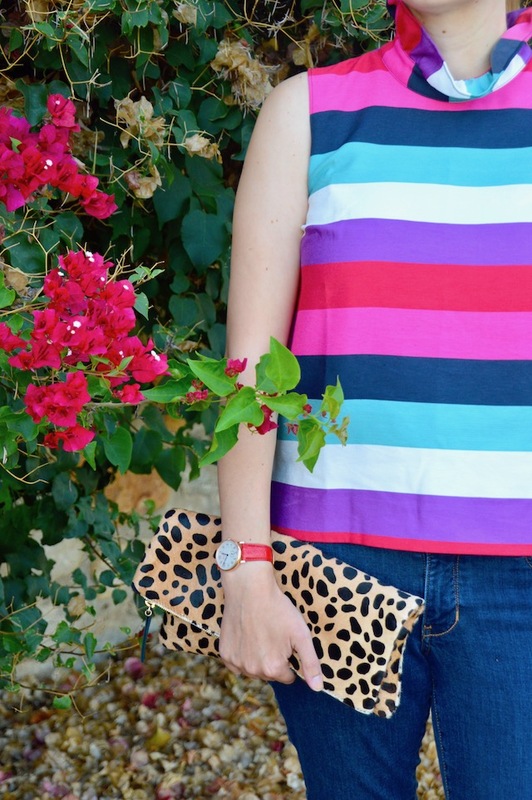 Love that you paired the brights with a classic leopard bag. It also gives a little hint of edge to the overall sweet look.